Today Arcep is publishing its annual scorecard that delivers a snapshot of the French telecoms market’s key economic data. The results of this scorecard, and the effects of the pro-investment regulation implemented by Arcep, will be presented this morning at the third edition of the annual Telconomics press conference. 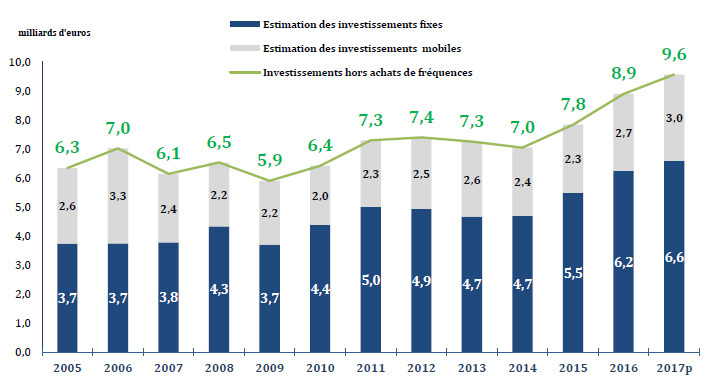 In 2017, operators in France invested 660 million euros more than the previous year, for an overall total (excluding spending on frequencies) of €9.6 billion. Arcep welcomes this level of investment: ‘ Two years ago, I asked operators to break open their piggy banks, to rise to national coverage challenges, and enable France to catch up on the connectivity front. With an investment of €9.6 billion, we are seeing the sector’s growing commitment to making up for lost time, and coming in line with the country’s infrastructure needs,’ says Arcep Chair, Sébastien Soriano. Both the regulator and the national government have worked to support this push. Through its pro-investment regulation, Arcep is lowering barriers to entry while also making stakeholders accountable and enabling all of them to monetise their efforts. Operators thus all have something of a “right and duty” to take part in making the investments needed to outfit the country with competitive infrastructures. Having navigated a paradigm shift that resulted in a New Deal for mobile, as proposed by Arcep, the national government opted to make regional development a greater priority than the financial windfall it could have obtained from frequency auctions when reallocating mobile operators’ longstanding spectrum holdings. The latest edition of Europe’s Digital Economy and Society Index (DESI), published on Friday, 18 May, reveals that France has not yet caught up on the connectivity front: the country ranks 23rd all networks combined, 27 th on fixed superfast broadband, and 21 st on 4G coverage (having moved up two spots). Furthermore, future 5G rollouts will require certain necessary investments to avoid a repeat of the lagging pace that has occurred with earlier technologies. Arcep thus calls on operators not to flag in their efforts over the coming years; ‘ we cannot continually be in a situation of working to catch up. Now that the sector is fully galvanised, we must absolutely not fall behind with 5G,’ said Sébastien Soriano during an interview with Next INpact .